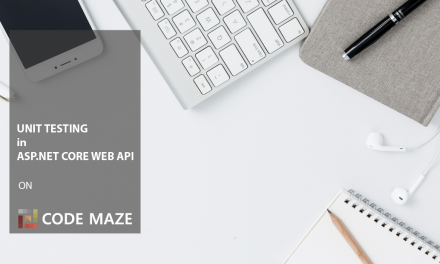 While sending requests to our web API server, we can get an error in response. 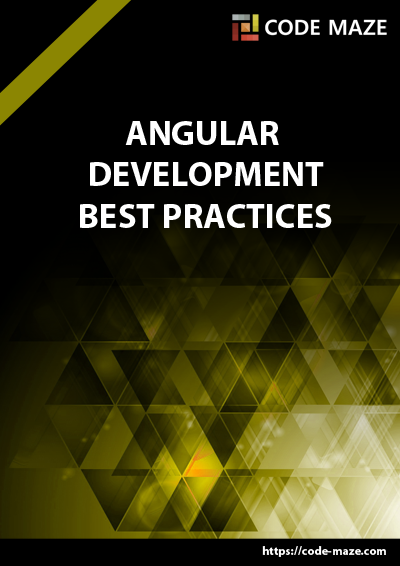 Therefore, using Angular Error Handling to handle those errors while sending HTTP requests is a must. That’s exactly what we are going to do in this post. If we get the 404 or the 500 error, we are going to redirect the user to a specific page. For other errors, we are going to show an error message in a modal form. The page that handles the 404 error is already created, so, let’s continue on by creating 500 (Internal server error) component. 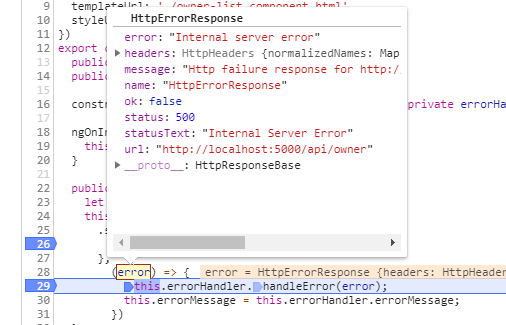 We have created our component and it is time to create a service for error handling. In the folder shared/services create a new service and name it error-handler.service.ts. Don’t forget to import this service into the app.module.ts file, and to register it inside the providers array. First of all, we are injecting the Router which we use for redirecting the user to other pages in the code. In the method handleError(), we are checking for the error’s status code and based on that we are calling the right private method for handling that error. The handle404Error() and handle500Error() functions are responsible for populating the errorMessage property. We are going to use this property as a modal error message or an error page message. We are going to deal with the handleOtherError() function later, thus the comment inside. You can try it out by changing the code in the server’s method GetAllOwners. As the first line of a code add return NotFound() or return StatusCode(500, “Some message”), and you are going to be redirected to the right error page for sure. Let’s continue by creating a component for the owner details. 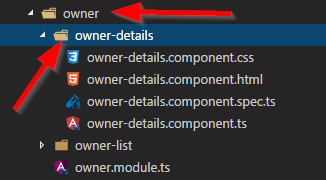 Create a new folder and owner-details component files inside the owner folder and import that component inside the owner.module.ts file. As you might have noticed, the new path now has the parameter id. So when we click on the Details button we are going to pass this Id to our route and we are going to fetch the owner with that exact id in the OwnerDetails component. By using a question mark, we are making our property as optional. <button type="button" id="details" class="btn btn-default"
On a click event we are calling the getOwnerDetails function and passing the owners id as a parameter. So we need to handle that click event in our owner-list.component.ts file. We have all the code for supporting the owner-details component. 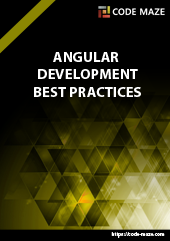 Now it is time to implement business logic inside that component. It is pretty much the same logic as in the owner-list.component.ts file, except now we have the ActivatedRoute imported because we have to get our id from the route. After we execute the getOwnerDetails function, we are going to store the owner object with all related accounts inside the owner property. In the next part of the series, I am going to show you how to create child components and how to use @Input, @Output, and EventEmmiters in Angular. By doing so, you are going to learn to split your components into smaller parts (parent-child relation). Marinko Hi, I have a question. Because of that this.errorHandle is undefined and error message from server never shows in the internal-server.component.html. What is the solution for this problem? Hello Gkcn. Thank you very much for reading our post. Well if I understood you correctly, you have thrown an exception from the server (in GetAllOwners method) but in the client side, you have a problem. If that is the problem, I would really like more info from you because I have tried all (right now) to break the app and I couldn’t do it. As you can see, all is working as it supposed to do. You can share the code with me or to download our source code and to check for differences, because I can’t help you more right now, but I would like for sure. So if you can share some additional data, it would be great. I figured out the problem. We shoul https://uploads.disquscdn.com/images/6c84244ff022642ca4e9806be5cd406fc162d3b4d1b9f51fa4e142be57dc1a1e.png d inject the ErrorHandleService to InternalServerComponent. And after that, on ngOnInit we should set the message to InternalServerComponent.ErrorMessage. After doing these steps we will see the exception message in the 500 page. It’s strange that I still see the “this” as SafeSubscriber. But HandleError method still works. I can’t figured out. I changed the error handling mechanism by returning json object when the exception occurs. This is why 500 page is little bit different. Thank you for the fast response. 🙂 I figured out the problem. We should inject the ErrorHandleService to InternalServerComponent. And after that, on ngOnInit we should set the message to InternalServerComponent.ErrorMessage. Hi mate. I am really glad that you solved it out, but I really don’t know why you had your problem at all. 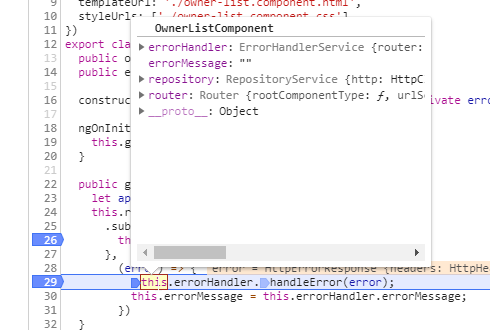 I believe that the problem is not related to the ErrorHandlerService but to the OwnerList component. But why, I am not sure at all. Either way, well done, your comments can help someone for sure if they find the same problem. Thank you for that.